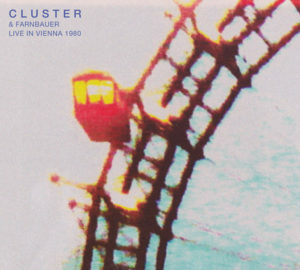 As Live in Vienna’s sound engineer, Eric Spitzer-Marlyn, recalls, Cluster’s 1980 performance at the Wiener Festwochen Alternativ would have been called a “happening” in an earlier time. Growing out of the Actionism movement of the ’60s, the festival was more performance art than music concert. Disdainful of the tired, commodified art of the establishment, it was a sound marked by brash, improvised, avant-garde techniques. Spitzer-Marlyn also recalls that it was loud. For those who had grown up with Cluster’s accessible ’70s work with Eno and Plank, and their collaboration with Michael Rother in Harmonia, Live in Vienna’s slow-growing swaths of electronics and noise must have represented a bit of a shock. But it was really more of a throwback to Cluster’s earliest years, when they performed dense electronic “jams” with Conrad Schnitzler as Kluster. The addition in Vienna of Joshi Farnbauer, a friend and fellow artist who played percussion and explored the sound possibilities of his own sculptures, also mirrored the fluid and spontaneous configurations that characterized those times. As chance would have it, they never meet up with Farnbauer again.